Steve Renouf is a highly successful former Rugby League superstar. He successfully balanced his professional career following the revelation that he had Type 1 Diabetes. Steve was a talented player who first showed his potential at age 17 with the Brisbane Broncos. He developed quickly and the world was his oyster until he suddenly fell into illness at 23 years of age. Following the diagnosis, Steve flourished and became a legend. 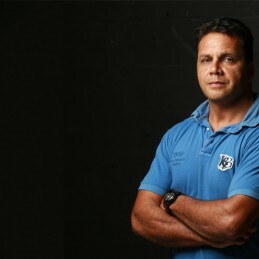 Steve made the Queensland State of Origin team for the first time in 1991 and the following year played for Australia and won a World Cup game with the winning try. He also had a stint with English side Wigan and finished as one of the top ten NRL try scorers in history. The Brisbane Broncos have formally recognized him as one of the top twenty players to have played for the club. Following his retirement, Steve became a sideline commentator for Radio Triple M’s Blood Sweat and Beers show. Steve’s 2006 biography The Pearl: Steve Renouf’s Story tells the heartfelt story of his family, Aboriginal identity and rugby league career. In 2008, Steve was honoured as a member of the Indigenous Team of the Century. Steve currently works in the Queensland Get Active School Program, promoting healthy lifestyles and physical activity in youth. Steve and his wife Elissa have also developed a website, Diabete-ezy, to support families with children like theirs who suffer from Type 1 Diabetes.